Machete Lite is a basic video editing tool which offers a couple of useful tools. It can cut off extra content from the video file without having to transcode or re-encode the file. Basically, you open a video with the program and play it as it were a video player. 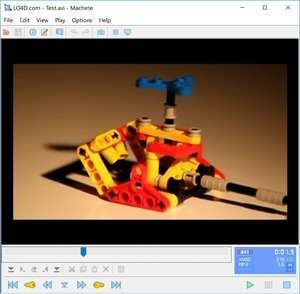 Frame-to-frame, you can find footage, select from beginning to end and remove the section of the video you'd like to remove. Version 5.0 build 22 is a freeware program which does not have restrictions and it's free so it doesn't cost anything. For security reasons, you should also check out the Machete Lite download at LO4D.com which includes virus and malware tests. Additional screenshots of this application download may be available, too. Machete Lite has a presence on social networks.